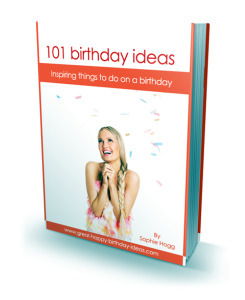 Get my 101 Brilliant FREE Birthday Ideas Ebook ! Are you needing some birthday ideas and inspiration? Sign up to my newsletter and receive regular updates of the best birthday ideas, including this months online contest. As a thank you for signing up I'll send you a copy of my birthday ideas ebook absolutely free. During my extensive research for this website I've compiled a list of brilliant birthday brainstorming activities, ideas and days out for your birthday. Some are quite traditional, but there some quite random ideas you won't have thought of! Whether you're looking for something different to do on your birthday, either on your own, or ideas for a big party celebration, download my free birthday ideas ebook for ingenious inspiration. The ezine is a newsletter email, sent every month full of the latest news and gifts, cakes and party ideas. I will not contact you regarding anything else and will never sell or pass on your email to any-one else. An ebook is a PDF file sent as an email attachment. If you decide you'd rather not receive the newsletter, you need only contact me and I will remove your details from our address list. I promise no spam or unwanted contact. I hate it in my inbox and don't want to inflict it on any-one else! You can download as many copies of my free ebook as you like. If you have any questions or suggestions please don't hesitate to contact me. Did you know that birthdays are a pagan celebration? Birthday records were kept 100's years ago to assist in the preperation of horoscopes. Early Christians and Jews never celebrated birthdays. The origin of the birthday cake dates back to ancient Greece. The round shape came as the cake was presented to the Goddess of the Moon, the candles were symbolic of the moon shining as it was presented to the Goddess. It is said that the smoke from the candles as they were blown out carried wishes to the Gods in the sky.